Torrential rain meant no play was possible between Surrey and Sussex in the Royal London One-Day Cup at the Kia Oval. Sussex had won the toss and put Surrey in when rain began just before the scheduled 11am start. After it stopped, a 40 overs a-side game was due to start but ten minutes before the re-start at 12.45pm torrential rain accompanied by thunder and lightning began. Umpires Richard Illingworth and Jeremy Lloyds abandoned the game at 2.35pm with large puddles on the outfield and no prospect of an improvement in conditions. It was Sussex's second successive washout after their game against Gloucestershire in Bristol on Sunday met a similar fate. And it meant frustration for players on both sides. Morne Morkel's Surrey debut is now expected to be in Friday's game against Kent at Beckenham. Mark Stoneman, who was left out of England's squad for the second NatWest Test against Pakistan, also missed the opportunity to get some runs under his belt. 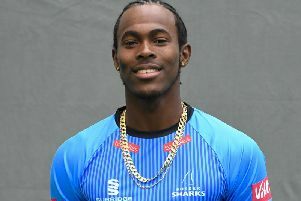 Sussex had included all-rounder Chris Jordan, who only returned from his IPL stint with Sunrisers yesterday, and Jofra Archer. Both will now play on Friday when Sussex face Glamorgan in Cardiff.